Pikmin is one of those series that probably wouldn't still exist under a different banner. It's one of Shigeru Miyamoto's babies, an idea he fostered by playing in the wilderness as a child. One he's going to see through until the end. I didn't love it as much as Miyamoto -- that is until Pikmin 3. After years of casually playing the series I finally "got" it after a few multiplayer sessions with my wife, and I still play its Bingo mode to this day. If it hasn't clicked for you yet, Hey! Pikmin likely won't change your mind. Unless you like amazingly cute things. If you're expecting some grand lore revelation from this portable spinoff...just don't. Hey! Pikmin kicks off with a storybook-esque opening of Olimar crash landing on a planet, and must once again save himself from the perils of its lifeforms with the assistance of the always helpful Pikmin creatures. Think of it as a muted re-telling. At this point Nintendo has shown that they're fully capable of making great games with little to no story, so it doesn't bother me one bit. Mechanically, Hey! is a lot like any other Pikmin, just in 2D. 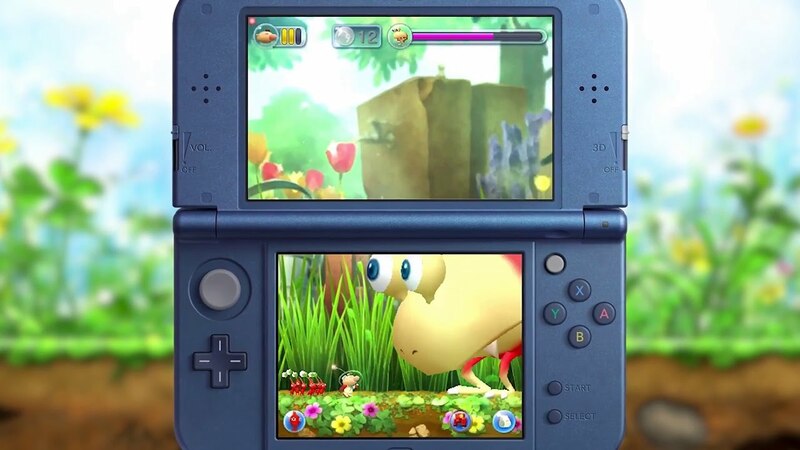 Using a scheme that primarily employs the circle pad and the stylus, you can tap/fling Pikmin in any direction to have them attack enemies or grab objects for you, with slight UI nuances for triggering your jetpack (for a small float effect), whistling to recall your minions, and swapping Pikmin types. There's a lot of amalgams to the main series, like arcing throws correctly, knowing which Pikmin to fling where (and what their attributes entail), or having a certain amount of creatures lift specific objects. It works surprisingly well in 2D, and the 3DS itself, which allows the board to span across two screens at once, forces you to pay attention. Remember when nearly every DS game made you use the stylus in some hokey way, then the 3DS kind of just dropped that gimmick (much like 3D, which isn't supported in this by the way)? Well it's back! But not so gimmicky and very responsive. What's old and run down is new and fresh again. The real draw here is how damn charming it all is. Sure you're not fighting the controls, but Hey! Pikmin's ability to make you smile is admirable. I love how you can help your little creatures push objects (cute), and watching them get into scripted mischief (Rock Pikmin prove once again they're the best Pikmin) is amazing. But all that fluff comes with a price. Hey! Pikmin never really reaches its potential because it spends so much time in its training wheel phase. There isn't too much of a risk in losing Pikmin as you can just replenish your stock with frequent "nests," a holdover from the fact that you can't freely roam most levels if you get into a spot you can't climb out of. Bosses, put plainly, are disappointing, and go down in a minute or less with very little in the way of strategy. That's not to say it doesn't get taxing, because it does. Halfway in Hey! makes you start quick swapping between the types with strategic taps, even if you're divining ways in your head that it could have been more challenging as you do it. Does it get old? If you rush through each stage at a blazing speed, sure. If you take the time to comb for secrets, grab every collectible, and try to finish all of the secret levels? Absolutely not. You might run into several challenges that feel rote or remedial, but levels aren't so large and labyrinthine that they feel boring. A "Pikmin Park" hub is a cute idea (and operates much like the Bravely Default "wait and see" town that takes multiple cues from the mobile side) where you can send creatures to scour for items, but it's ultimately just a diversion from grabbing every single collectible in the story. The new Pikmin amiibo was not available for testing at the time of this review, but its functionality has been detailed. Hey! Pikmin is a little too simplistic for its own good, especially early on, but Arzest does a fantastic job of distilling what makes this series so special into bite-sized chunks. The transition cutscenes that play out like physical comedy shorts and the adorable little noises really sell it.